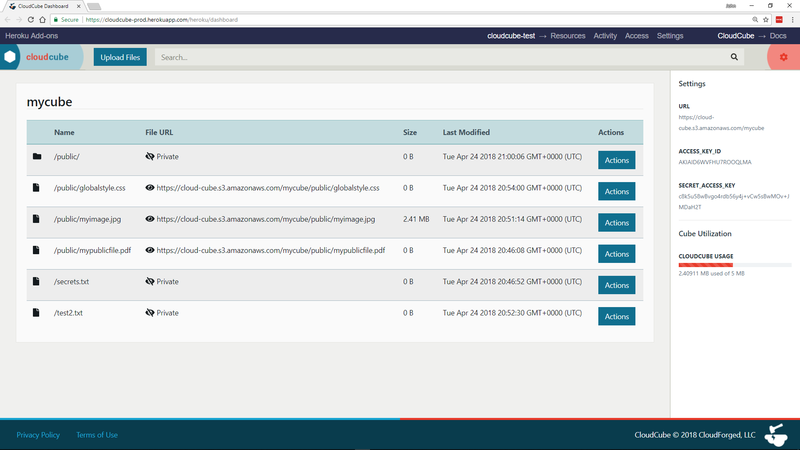 Cloudcube is an add-on that provides fast and easy uploading and privacy management for static files on Amazon S3 via an intuitive dashboard. Upon provisioning, 3 config vars are set for your application automatically. Your app can use these to interact with your cube programmatically via one of the AWS SDKs or the AWS REST API. CLOUDCUBE_ACCESS_KEY_ID is the AWS Access key for accessing the underlying AWS bucket. CLOUDCUBE_SECRET_ACCESS_KEY is the AWS Secret that, when paired with the Access Key, allows manipulation of your cube from your app code. If the custom cube name is not available, the provision attempt will return an error. The Cloudcube dashboard is a GUI representation of your cube and its contents. You can use it to upload and search for files, as well as move, rename, and delete them. 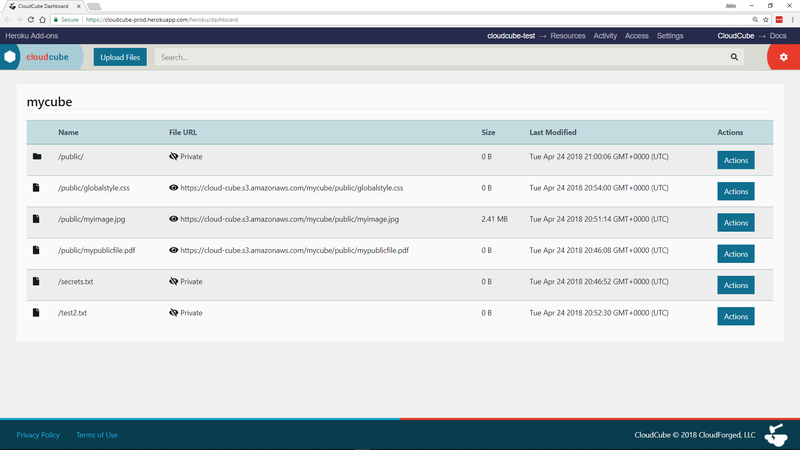 Cloudcube files can be either public or private. Public files are given a URL that can be shared with others or used from your application code. Private files are not given a URL and cannot be accessed. The privacy of a file is determined by its file path within the cube. To make a file public, its path must include a directory named public. All other files are private by default. Cloudcube provides AWS IAM credentials that you can use to access your cube programmatically. Take care to NEVER hard-code your credentials into your application. Pushing your code to a public place like Github will expose these hard-coded values to the world and alert us that your account has been compromised. Cloudcube will subsequently rotate your credentials without notice and any code or client relying on the old credentials will lose cube access until the new credentials are used. It is good practice to have your application refer to the Config Vars set on your Heroku application rather than the literal values themselves. This keeps them hidden and your account secure. E.g. If your URI is https://cloud-cube-eu.s3.amazonaws.com/mycube, then your bucket name is cloud-cube-eu. When interacting with files, the cube name must appear as the prefix to any key you upload, modify, or delete. Buckets are hosted in different AWS regions and these regions can be determined from the following table. AWS offers SDKs in several languages as well as a CLI which can be used to manipulate your cube files. Your Cloudcube plan can be upgraded or downgraded from your Heroku application’s dashboard under Resources by choosing Edit Plan. Removing the add-on will result in the permanent loss of all files in your cube! Cloudcube can be removed from your application via the Heroku Dashboard under ‘Resources’. Support requests can be submitted via one of the Heroku Support Channels or to our support email support@cloudforged.com. Service news, updates, and status, can be viewed on our Twitter account.